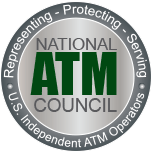 Quick Draw ATM is an independent sales and services company, and a member of the National ATM Council. We work hard to provide you with the superior Automated Teller Machine services that you desire and search for. At Quick Draw ATM, we want to be your partner by providing an ATM solution that is customized to fit your needs. Whether you're looking for sales, service, or support, look no further than Quick Draw ATM. We are dedicated to service—it's our #1 priority! We specialize in the placement of Automated Teller Machines for Corporate Businesses in the Bay Area. From your company store to your cafeteria, we ARE the solution for your ATM needs.